Puerto Rico's Health Safety Net Facing More Deep Cuts : Shots - Health News State Medicaid programs already get much more money from the federal government than Puerto Rico Medicaid gets — and the storm-ravaged U.S. territory's safety net for the poor is barely hanging on. 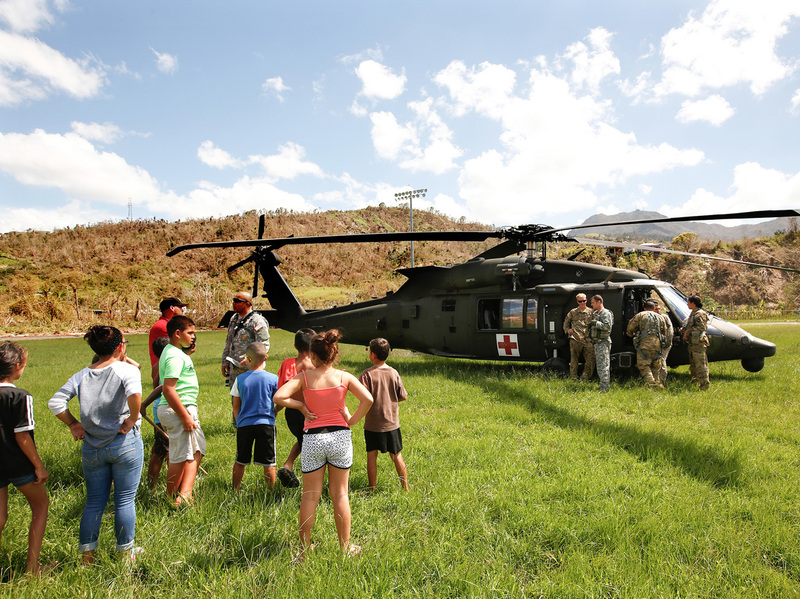 In the mountain town of Juyaya, Puerto Rico, last October, children watched as U.S. Army helicopters brought a team of physicians to assess the medical needs of the local hospital and residents. Going forward, health economists say, the U.S. territory will need continued federal help to deal with its overwhelming Medicaid expenses. The government here needs to squeeze $840.2 million in annual savings from Medicaid by 2023, a reduction required by the U.S. territory's agreement with the federal government, as the island claws its way back from fiscal oblivion. Overall, Puerto Rico faces a crushing debt of more than $70 billion — much of it due to the territory's large Medicaid expenses. That's on an island where the average household earns $20,000 annually and diabetes and hypertension are widespread. The cutbacks do nothing to address the underlying fiscal imbalance at the root of Puerto Rico's health care woes, which stem from the fact that the federal government already contributes a much smaller fraction of the U.S. territory's Medicaid budget, compared to what it contributes to the 50 U.S. states. "We are rearranging the chairs on the Titanic," says Dr. Jaime Torres, whose jurisdiction included Puerto Rico when he served as a regional director of the Department of Health and Human Services. "These people who have been under our service for the last four or five years — all of a sudden I have to abandon them," says Dr. José Joaquín Vargas, president and chief medical adviser for VarMed, the Bayamon-based company that operated the program that employed Calderón. If Puerto Rico were a state, the federal government would pay 83 percent of its Medicaid costs. (It pays upward of 70 percent of Medicaid expenses in 10 states, according to a formula that takes a state's economy into account.) But because of a 1968 law capping the amount of Medicaid money Washington sends to U.S. territories, the federal government pays only about 19 percent of Puerto Rico's Medicaid costs, and as a fixed annual payment, or block grant. In February, Congress approved $4.8 billion in additional funds to help pay the island's Medicaid bills. But the additional payments are widely viewed as a stopgap measure; health economists say that extra money is likely to run out in September 2019, a grim estimate shared by the territory's fiscal oversight board. That's a federal control board established by Congress in 2016 to oversee Puerto Rico's budget, negotiate with its creditors and help restructure at least some of the island's debt. Gov. Ricardo Rosselló's administration aims to reduce Puerto Rico's Medicaid spending and improve access to care by putting an end to years of regional monopolies by private health insurance companies. The insurers have locked patients into narrow networks of health care providers. Later this year, under Rosselló's plan, the companies will be forced to offer island-wide insurance plans and compete for customers. "We do not have the luxury" of continuing to spend inefficiently, says Ángela Ávila Marrero, executive director of Puerto Rico's Health Insurance Administration. If Rosselló's overhaul fails to achieve adequate savings — as most observers predict — drastic cuts are in the offing. Among those cuts: Some 1.1 million of the 1.6 million Puerto Rico residents on Medicaid are at risk of losing coverage next fall, their health held hostage to the island's need to pay back its crippling debt. Puerto Rico's government effectively defaulted on more than $70 billion in debt. Economists blame a decades-long recession, a corporate tax break that ended in 2006, and reckless spending by a bloated government. But also to blame, they say, and largely unnoticed in discussions of the debt, is Puerto Rico's staggering Medicaid burden. Footing medical bills without the kind of federal assistance dispensed to states has effectively doomed the island's fiscal health, health economists say. Researchers of health care say that, putting aside interest on Puerto Rico's debt, the territory's primary fiscal deficit would have been erased had Congress paid the same share of Medicaid bills that it pays the 50 states and Washington, D.C.
"The main issue is that we are not yet a state," says Rep. Jenniffer González-Colón, the territory's nonvoting member of Congress. The island must pay for Medicaid, she adds, "with local funds that we don't have." Puerto Rico's health care system was already convulsing in September 2017 when Hurricane Maria struck. The federal government had issued warnings that the island would soon run out of additional Medicaid funds provided by the Affordable Care Act, and that 900,000 Puerto Rican residents would lose coverage. "If your kid needs a neurologist, for example, the waiting period is around six to 12 months," says Dr. Jorge Rosado, a pediatrician in San Juan. "For a genetics specialty, it's two to three years." Barring the unlikely passage of bills that would eliminate the cap on federal Medicaid spending in Puerto Rico, the disaster relief fund is projected to run out in the fall. González-Colón also has authored a bill calling for statehood, which would eliminate the federal government's unequal treatment toward the island's Medicaid program. The fiscal control board established by Congress openly acknowledges the impending disaster. In an April 19 report (p. 97 of "New Fiscal Plan For Puerto Rico: Restoring Growth and Prosperity") the board projects monthly costs per Medicaid patient will rise nearly 40 percent over the next six years, barring any changes, and that Puerto Rico "will hit a 'Medicaid cliff.' "
The island's government has vowed to pay private insurers extra money to care for those patients that have expensive or chronic medical conditions. Insurers have cautiously welcomed the changes. "I support the government on what they're trying to do, but they didn't price it properly," says Dr. Richard Shinto, the president and chief executive of InnovaCare, an insurance company that sells plans in Puerto Rico. "The oversight board is fixated on cuts," he says, "but we're never going to improve health care unless more money is put into the system." Government health officials argue that their changes mean Medicaid patients, especially those outside the San Juan metropolitan area, will gain access to more specialists, who are concentrated in the capital. But staff at the island's clinics and hospitals fear they will be squeezed by insurers seeking to reduce costs, even as the clinics are still reeling from hurricane-related expenses. Many people displaced by the storm haven't yet been able to return home, and that, too, can complicate health care delivery. Carmen Ramos, executive director of Redes del Sureste, a conglomerate of 22 medical groups in Puerto Rico, says 60 percent of the letters she recently sent to patients on her mailing list were returned. "The managed-care companies need to produce revenue," says Victoria Sale, a senior director at Camden Coalition, a pioneer of social and health programs for the chronically ill. "That's a setup for concern." Bottom line? The economic overhaul doesn't rectify Puerto Rico's fundamental problem — it can't sustain its Medicaid program so long as Congress treats the territory differently than it treats states. "Next year, we will go back to Congress demanding the funding we deserve as U.S. citizens," says Torres. But, he adds, "it's time the local government started thinking about a Plan B."